Though skin care seems like a recent indulgence, the roots of this concept can be traced back to the time of Ancient Egypt. Egyptians were the first to document their skin care practices, followed by the Chinese, Greeks and Romans. We all spend a lot of time and money on skin care as we have access to advanced products that help us hide our imperfections and enhance our beauty. But, have we ever wondered when and how did this concept of skin care begin? Although it may seem like a trend that picked up pace just two to three decades ago, you may be surprised to know that the idea of caring for your skin dates back thousands of years. It wouldn’t be wrong to say that the history of skin care and cosmetics is as long as mankind itself. 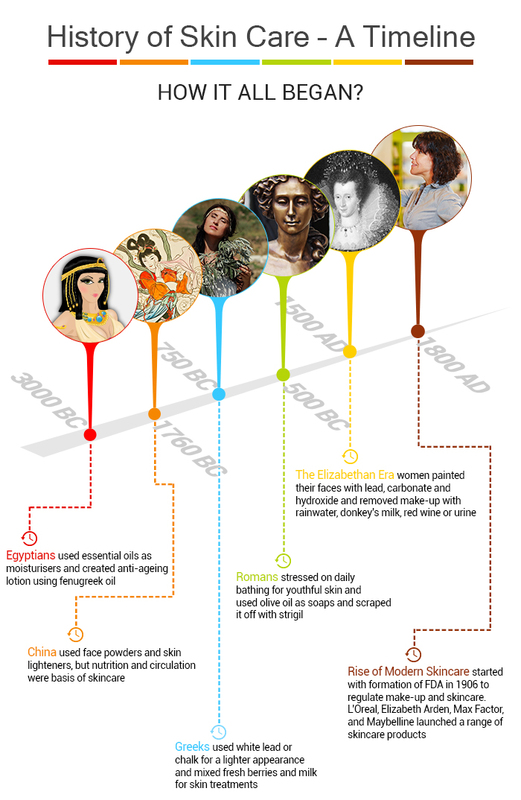 Here we go down memory lane to find out how skin care and cosmetics has evolved over the years. The roots of skin care can be traced back to 3000 BC, when Egyptians turned to nature for remedies to beautify their appearance. Egyptian queens took great care of their skin and the way they looked. Who hasn’t heard of the eternal beauty of Queen Cleopatra and her infamous sour milk bath? Egyptians created natural skin care products using olive oil, ostrich eggs, dough, milk and essential oils from plants and herbs. Exfoliating scrubs were made from sand and aloe-vera, and plant oils were used as moisturizers. Body oils were developed to treat specific skin ailments like stretch marks in women. Some of the finest natural skin care products of today use Egyptian secrets like aloe, sodium bicarbonate, myrrh and frankincense. Also, we can owe the creation of the first anti-ageing lotion to Egyptians. They used concentrated fenugreek oil to reduce wrinkles and other skin imperfections. Along with skin care, make-up was also an important part of the Egyptian culture. In fact, the application of makeup was considered as a ritual to honour their gods or goddesses, so common women also wore it liberally. Women applied eye-shadows made by crushing metal ore, copper, and semi-precious stones and mixing them with water, oil, or animal fat. Kohl, pumice stones and special hennas were also used by royal women of Egypt. Skin care and make-up were not only an important part of daily life, but also in afterlife. Archaeologists have excavated many make-up containers and the remnants of body oils from Egyptian tombs. While the Chinese began to paint their fingernails with gum arabic, gelatin, beeswax and egg white from around 3000 BC, the real skin care in China only began from 1760 BC under the Shang Dynasty. People during this time valued a healthy, natural pale look and used face powders and skin lighteners to achieve that. The first written records of a skin care system in China came during the Qin Dynasty. An Empress developed her skin care systems and recorded them in a book. She used natural cleansers made from seaweed and jellyfish and facial massages and exercises to improve the circulation in the cheeks and forehead. She also believed in the link between diet and skin care, and said that eating black beans, sesame seeds and Chinese yam would improve the skin. During the Tang dynasty, powdered face and smooth skin became a fashion statement. Courtesans used white powders made from lead to get a whiter complexion. They also used natural gels and lotions to remove pigments and permanently bleach their skin. One of the most popular skin lighteners was songyi mushrooms, an ingredient that is used in many skin lighteners even today. Despite the popularity of powders and creams, skin care in China was more about nutrition, health and circulation. They focussed on healthy living to maintain a beautiful complexion and used many traditional herbs to stay healthy. Greeks borrowed a lot from Egyptian skin care secrets, but adopted them with their twist to it. They adapted their own methods for distilling the oils and essences from herbs and other plants. Honey was used as a moisturizer; oils and sand were used to protect skin from the sun damage. Like the Chinese, the Greeks also associated tanned skin with the lower classes and hence women often used white lead and chalk to lighten their complexion. The great Greek physician Hippocrates developed diagnostic and treatment methods for various skin conditions, some of which are still used by dermatologists. Romans associated skin care with cleanliness and hygiene, making bathing a culture. They rubbed themselves with olive oil to remove dirt and scraped it off with a curved metal tool, called a strigil. Royal Roman women used crocodile dung to lighten their skin, while poor women stuck to cheaper alternatives like lead and chalk. It is believed that it was ancient Roman physician, Galen, who developed a cold cream by melting beeswax into rose oil and then adding water. As the Roman Empire spread to Europe and the Middle East, a lot of new things were added to skin care and new products were developed. The mineral alum, a popular astringent, was used to treat scabs and abrasions of the skin; olive lead extract was known to have acne fighting powers. The popularity of pale, white skin spread across Europe too. So, the demand for lead-based skin care and makeup increased. European women used lead in various ways. They mixed lead with vinegar to make whitening foundation; they used it in facial peels and used it to remove freckles. Europe’s most iconic women, Queen Elizabeth I, popular was her excessive usage of lead-based whitening foundation. During the Elizabethan Era, bathing was out of fashion; men and women rarely washed their faces and body. To keep their skin looking pale, they choose to add a new layer of powder over the old. As the cosmetic layer became difficult to wash off, people started experimenting with everything from rainwater or donkey's milk to red wine or urine. It was the Elizabethan Era, when doctors started identifying the side-effects of lead and recommended switching to alum or tin-ash based powder. But still the popularity of lead prevailed until 1869, when for the first time the use of lead in cosmetics was challenged. The American Medical Association published “Three Cases of Lead Palsy from the Use of a Cosmetic Called Laird’s Bloom of Youth” and paved the way for the formation of the Food and Drug Administration (FDA) in 1906. Starting in the early 1900's, many cosmetic companies such as L'Oreal, Elizabeth Arden, Max Factor, and Maybelline first started developing skin care and cosmetics for women everywhere. After the 1900s, skin care advanced significantly and we saw developments of many products featuring cutting-edge ingredients that aim to improve the look and feel of skin.